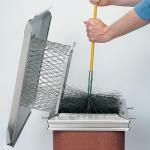 * Brush-finished, 100% 304 stainless steel-flue cap features classic styling with a cross braced lid. 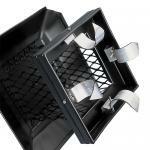 * It is fully resistance-welded and features a roll-formed, 18-ga., one-piece base. 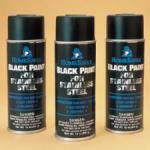 * The extra wide base contains a concave channel for added strength, good looks, and versatility. 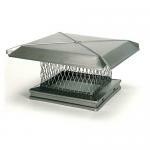 * This single-flue cap features a 24-ga. lid with a one-piece, 8" high, 3/4" or 5/8" mesh of 18-ga. stainless steel.